Comics has had a number of Wild Wests over the years, frontiers where rules are broken or ignored and outlaws flee the mainstream to carve out new niches. The ’60s had the comix crowd, the ’80s had the small press boom and the advent of the internet has brought the webcomic, a frontier that grows larger with every new advance in free web distribution platforms. I’m not immersed as I’d like to be in the webcomic scene, time is my enemy and the internet is time with amplified power, a total soulsuck that gets deeper the further you plunge. So I’ve learned to trust in the curators at Study Group, a webcomics collective that shares aesthetics and philosophies with the art comics world that I’ve got a better handle on. 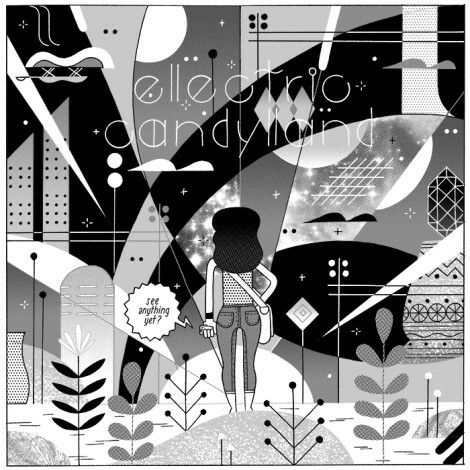 Study Group’s body of work isn’t unified by theme or tone but lately their best material has seemingly been influenced by the tropes and structures of kid lit, from Aleks Sennwald and Pete Toms’ meta-child detective noir Short Con to Jesse Tise’s new series Electric Candyland. It’s no accident that I pair those two together, either. Short Con has a more organic style, rounded panels containing scratchy hand drawn urban weirdlings decked out in vivid watercolor but at its heart it’s a story of rivalry and education, just as Electric Candyland is. But Electric Candyland stands out for its architectural style, Tise utilizing geometric design to give the series the heady feel of a missing link between Cubism and Futurism, only without the fascist philosophies and mechanized removal of emotion. That might not sound like a whole lot of fun, but Tise has a mastery over his shapes, making for a heartfelt story of professional jealousy and a need to impress that should be easy for anyone to sympathize with. 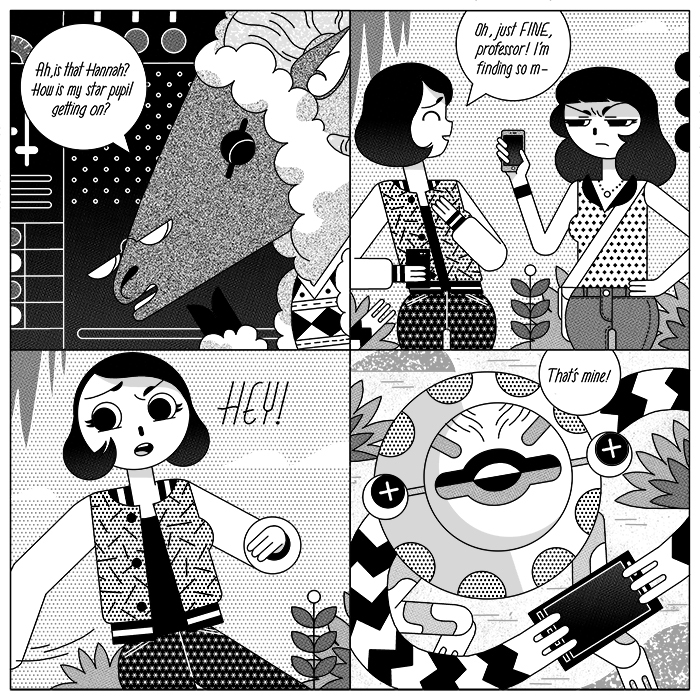 The story focuses on Liz, a young anthropologist of sorts, who observes alien life forms at the behest of her professor, a somewhat cranky old ram. Though Liz is seemingly new to the field, she already has a rival in the form of Hannah, a star student who has the obnoxious habit of rubbing her accomplishments in Liz’s face in the nicest possible way. When an alien steals Hannah’s observation device, Liz is forced to follow them into a dimensional rift, with no guarantee of safe return. Though the plot is by no means groundbreaking, it’s wise of Tise to stick to archetypes that are easy to connect to since the art itself is so alien anything more narratively complex would be a distraction. The pages of Electric Candyland are similarly simplistic, sticking mostly to rigid four panel squares, with occasional single or double panel “splash” pages. But Tise’s character designs only appear simplistic, each figure comprised of a number of shapes, laid out mathematically but lovingly, perfectly round eyes and rectangular limbs conveying ample emotion. Mainstream comic fans often express wonder at “photo realistic” artists like Alex Ross or Bryan Hitch, who offer “cinematic” character designs but frequently struggle with character acting. Tise’s designs are mathematically precise and by no means realistic, yet Electric Candyland is full of highly expressive panels that cause empathetic reactions, the emotion registering more easily and organically than the realism fans encounter with either mainstream maximalists or even the biocomic crowd that believes they’re on the opposite end of the spectrum. That emotional connection grounds the trippy, geometric sci-fi at the root of Electric Candyland, allowing the sterile confines of anthropology to merge with more universal motifs, like professional rivalry and a desire to do the right thing despite personal cost. Jesse Tise’s art might look otherworldy and initially cold but there is true warmth to Electric Candyland, making it one of Study Group’s most heartfelt and stylish releases so far. Electric Candyland can be read for free at Study Group.